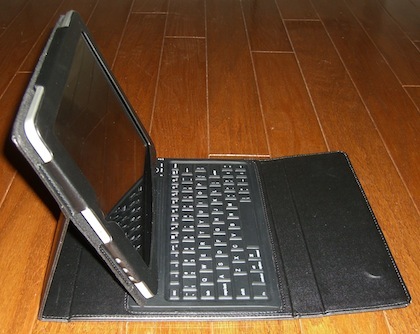 Several companies have been showing a case for the iPad that includes a Bluetooth keyboard. Just yesterday we were talking about the Kensington KeyFolio™ Bluetooth Keyboard. Which like the many others have been accepting pre-orders but we have not gotten anything yet. Friday, the day after Thanksgiving, the postal person gave several of us packages. 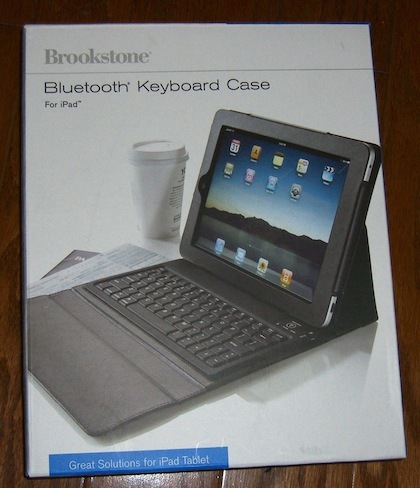 They were from Brookstone and contained their version of the Bluetooth Keyboard iPad case. 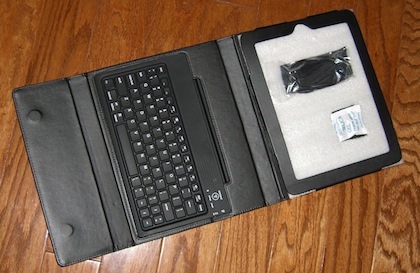 Unpacking the Keyboard Case you will get the actual unit along with a USB cable which is used for charging. 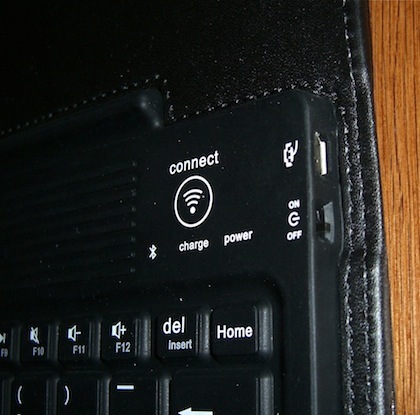 The keyboard appears to have a charge when it arrived, but the manufacture says that a 4.5 hour charge will allow the Bluetooth Keyboard to operate for 90 hours of use. Pictured below as it comes out of the box, white foam in place of where the iPad will go. 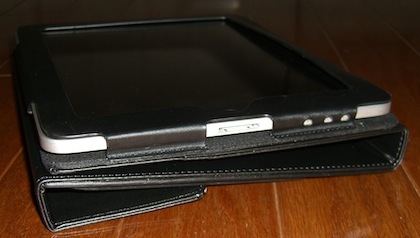 The iPad slides in with a tuck under lip like the Apple thin case has. Once in, you will want to go to the Settings area of the iPad and choose to have the Bluetooth look for a new connection. On the end of the keyboard is an on/off switch and the USB for charging. The iPad will ask you to enter a series of numbers to pair the two together. 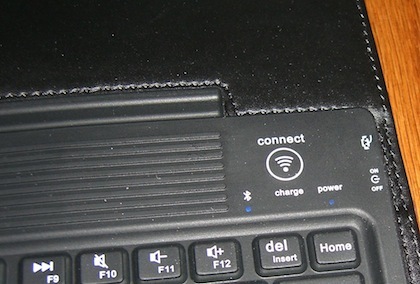 On the top of the keyboard, just below the Connect art is two blue lights. One for saying that you are on, powered up and the other saying you have a Bluetooth connection. The Power LED will blink when the keyboard needs charging. Once you have the two paired the first time, turning the keyboard off to save power then back on, the two reconnect without any action on your part very quickly. 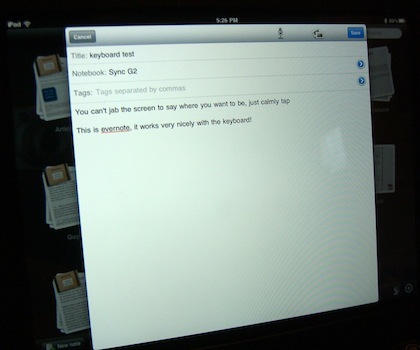 The iPad stands up nicely at a good angle for seeing the screen while typing. There is no locking mechanism, it is just the lip of the case resistant to moving across the soft rubber of the keyboard upper area. 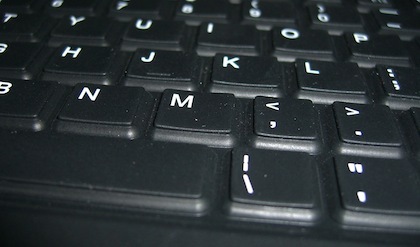 The keyboard is the rubber over cell type, most often used with USB water proof keyboards. Within a few seconds of launching QuickOffice, a new document was created and typed text was appearing as keys where tapped. As the text on the screen states, there are a few keyboard keys missing or at the least moved. It took a while to stop looking for a ‘shift’ key on the right. There is a reason we are willing to live with this in order to have an all-in-one Bluetooth keyboard case. The Bluetooth keyboard from Apple is one of the nicest to type on but it is longer than the iPad making it harder to carry effortlessly from meeting to meeting. When closed, the case is actually comparable to other full size cases. Since this was a holiday weekend, we were unable to mass many iPad cases for a lot of size shots. 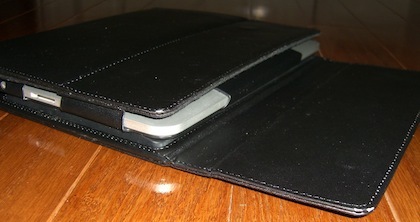 Here it is on top of a iPad in a iSkin and a iPad in a Apple thin case. 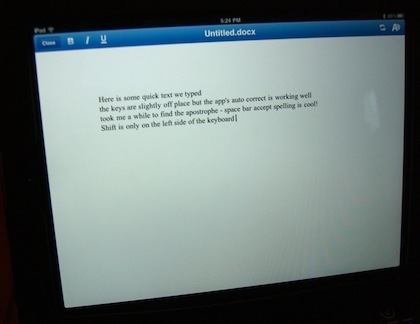 Using the keyboard with our heavily used Evernote worked quite well. After a half hour of use, he apostrophe was still missed a lot. Noted in the text is that there is a tendency to jab at the screen for curser location or button presses, it just takes a tap. Perhaps this is brought on by the need to jab at the keyboard keys more than the Apple offering. It is still possible to use the iPad in your hand in the portrait view mode by folding the case in reverse. Be sure to turn off the keyboard though, otherwise buttons are getting pressed by the flap and you will have a lot of weirdness going on with the iPad. Closing the case to carry, the flap as two magnets in it to hold to the overlapping part of the case. It is just enough to keep the case from unfolding when carrying under your arm.